These Name Tags offer a classic Window design for do-it-yourself name changes. Labeling systems make it extremely easy to print your own labels for your name tags. These systems work well with our Plastic and Metal name tags as well as our Economy Domed name tags. 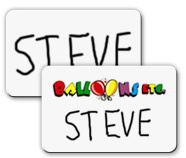 Change Names quickly with this reusable dry erase name tag's dry erase capability. When you want to change names, just erase the old one and write in a new one. "Sharpie" permanent markers work best on the dry erase name tags. To wipe off the old name, just use a cloth and some rubbing alcohol.